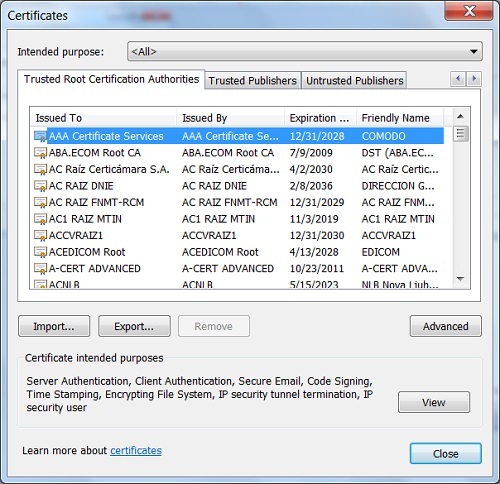 How to see the list of trusted root Certification Authorities (CA) and their certificates used by Google Chrome? 1. Click the "Customize and control Google Chrome" menu icon. 2. Click the "Settings" entry in the pop up menu. 3. Click the "Show advanced settings..." link on Settings page. 4. Click "Manage certificates" button in the HTTPS/SSL section. You see the Certificate Manager showing up. 4. Click "Trusted Root Certification Authorities" tab. You see the list of trusted CA certificates showing up.